Joined IDEA in 2003. Previously headed IDEA’s Nepal office based in Kathmandu. Hailing from Finland, Ms. Rikkilä Tamang has a background in the Dept. of Political Science and International Relations at University of Tampere (now part of Tampere University School of Management), and has been secretary-general of Finland’s Advisory Board for Relations with Developing Countries, KESU, which monitors and assesses issues related to Finland’s development relations and global policy. Besides she is a former chairperson (2001-2002) and later board member of Network Institute for Global Democracy (NIGD). Among her roles at NIGD, she co-ordinated projects promoting North-South dialogues on democracy and globalization and was involved in the World Social Forum process. She has also worked for the MOST (Management of Social Transformations) programme at Unesco, Paris. Among her publications could be mentioned, From a Global Market Place to Political Spaces (Helsinki May 2002), co-edited with Katarina Sehm-Patomäki, discussing Southern views on initiatives on global democracy. She has also written on matters related to gender and politicized religion in violent conflicts, especially in South Asia. During 2004 Leena Rikkilä co-ordinated IDEA’s project on constitutional dialogues in Nepal, see below. IDEA was an initiative proposed by the Swedish Parliament in 1991. Four years of discussions with representatives from more than 60 governments, some 20 international organizations, and more than 150 individuals followed. IDEA was then launched in February 1995 in Stockholm as an intergovernmental organization with funding from 14 countries. India was one of IDEA’s original 14 founding member states, and it is still the only South Asian member state. Japan is an observer. The Institute was mandated with the responsibility of sustaining and promoting democracy worldwide. IDEA was unique in that it was to be the bridge between academic researchers and democracy practitioners in the field. Rather than do electoral observations, it was instructed to work with both new and long-established democracies, helping to develop and strengthen the institutions and culture of democracy. IDEA continues to operate at international, regional, and national levels, acting in partnership with a range of institutions. The head office is located in Stockholm but IDEA also keeps field offices on many places all over the World. IDEA has been active in facilitating in-depth democracy assessment, dialogue and capacity-building programmes in many countries, among them in Nepal. The organisation has also published a large number of case studies on the use of quotas in Asia, Latin America, Africa, Europe, and the Arab world to increase the representation and participation of women in politics. It has further issued several handbooks to provide practical tools and guidelines on electoral systems, conflict management, quotas, and other issues related to democracy, developed extensive databases on voter turnout, elections administration and costs, political parties, and other topics for use by democracy practitioners, researchers and the media. IDEA also conducts professional training courses throughout the world for election administrators and officials from developing democracies, and has created a comprehensive questionnaire for local citizens worldwide to assess how well democracy functions in their own countries. Consultation to democracy practitioners at the national level are also offered, on such issues as referenda, constitutional reform, reconciliation processes and other democracy-related topics. Some of IDEA’s publications have been translated into Asian languages including Nepali and Burmese (Electoral Systems Design Handbook), Sinhala and Tamil (Policy Summaries of the handbooks on Electoral Systems Design and Reconciliation After Violent Conflict: A Handbook), Burmese and Indonesian (Democracy and Deep rooted Conflict: Options for Negotiators). IDEA also conducts developed the curriculum for professional training courses throughout the world for election administrators and officials from developing democracies, and has created a comprehensive questionnaire for local citizens worldwide to assess how well democracy functions in their own countries. Through its ACE network, consultation by way of interactive network to democracy practitioners at the national level are also offered, on many election related such issues such as referenda, boundary delimitations, voter registration and holding elections in the aftermath of conflict.constitutional reform, reconciliation processes and other democracy-related topics. • Sakuntala Kardirgamar-Rajasingham is a Senior Advisor to IDEA. Till 2008 she was Head of Programme (South Asia). She has a PhD in Law from University of Sydney, Australia, where she defended a doctoral dissertation addressing the problems of democracy in plural societies with special reference to Malaysia and Sri Lanka. Before coming to IDEA in 1998 she was based in Washington DC where she was a consultant to several NGO, UNDP and World Bank projects on gender and development. Prior to this she was a Programme Officer for the Law and Development Studies Division at the Marga Institute for Research and Development in Sri Lanka. She has written on women and development, women and political participation, conflict transformation and on democracy. The Kathmandu team consists of Sheri Meyerhoffer, Anushree Bhattarai, Khushee Tharu, Abinash Pokhrel, Sarita Nepal, and Rita Rai. Since 1997 International IDEA has been assessing the challenges to Nepal’s nascent democracy, and building a multi-party consensus to support a democratic governance agenda. A first assessment report on Nepal titled ”Consolidating Democracy in Nepal” was published in 1997. More recently (since 2004) International IDEA carried out work contributed to a democracy assessment in South Asia. In Nepal, IDEA’s State of Democracy assessment methodology, which is a means for local people to scrutinize their own democracy, was used as the framework. A new The Nepali State of Democracy in South Asia Assessment Report was launched in late December 2006, published by Oxford University Press, together with similar regional assessments carried out in Bangladesh, India, Pakistan and Sri Lanka. More information. The Democracy Assessment in South Asia provided the opportunity for in-depth dialogues on conflict transformation in Nepal at a time where there was a political impasse between the Monarch, the political parties and the Maoists. Currently IDEA has a project to support the constitutional processes in Nepal which includes: support for the creation of a credible and effective Constituent Assembly, strengthening women’s political participation, fostering greater inclusion of marginalised groups and communities and engagement with all the constituent units of political units supporting this transformation to democracy in Nepal. IDEA is also involved in a project about ”Political Parties in the Asia-Pacific”, consisting of data collection and analysis of legal framework. This is being done since 2004, within the framework of the newly established South Asia hub of the so-called Electoral Process and Information Collection Project. Partners of the South Asia Programme collected and analysed data on the legal frameworks of Bangladesh, India, Nepal, Pakistan, Sri Lanka and Maldives. The South Asian partner institution is Centre for Study of Developing Societies in Delhi, India. The South Asia Programme has also organized a project titled ”External Environment and Internal Party Management” on dialogue meeting and it commissions case studies which focuses from the region on the eternal regulatory framework and internal party management affecting political parties. The project has had a special emphasis on addressing the election of the party leadership, funding, and the inclusion of women in the party ranks and on party candidate lists. In 2005, a workshop was convened with the authors of the case studies, civil society monitoring groups, political parties and party organizers in order to discuss ways of increasing participation and accountability. Partners in this project are Centre for Policy Alternatives, Sri Lanka; Centre for Alternatives, Bangladesh; Centre for Civic Education, Pakistan; Centre for the Study of Developing Societies/Loknitti, India; and Institute for Integrated Development Studies, Nepal. A publication “Political Parties in South Asia: The Challenge of Change” is forthcoming. More information. • South Asian Approaches to Reconciliation. A regional network of organizations working on reconciliation and conflict transformation issues has been established, its first meeting was held in Stockholm on 17 March 2006. • Reconciliation Dialogues in Sri Lanka. To support the Cease fire agreement of 2002 and the prospects of building peace in Sri Lanka, IDEA convened in 2004 several dialogues on activities in the North, East and the metropolis of Sri Lanka, dialogues were held in 2004 to introduce and debate concepts and processes of reconciliation. Participants included the Sinhala and Tamil communities and policymakers. A forum for inter-faith dialogue on reconciliation was initiated in 2005. • Constitutional Dialogues in Nepal. IDEA convened several dialogues to encourage civil society and political parties address the prospects of linking constitutional reforms with peace building and conflict transformation in Nepal. • Constitutional Dialogues in Sri Lanka. A series of dialogues were held in Sri Lanka in 2006 on a comprehensive constitutional design (including federalism, decentralization and electoral reform). • Regional Training on Constitution Building Processes. IDEA brought in practioners from civil society and political parties from a range of countries undergoing constitutional reform processes in the region to understand the requisites of developing a participatory approach to constitution –making as this could form the basis for improved participation, representation and conflict management. • Dialogues on the State of Democracy in South Asia. IDEA is currently working onpartnered in the development of a regional assessment to reflect citizens’ perceptions and experiences of democracy. Scheduled for release in autumn December 2006, the report combines quantitative data (surveys) along with qualitative data (from case studies, dialogues and expert assessments) to establish a baseline study of democracy. IDEA’s partners on this project are the Centre for Studies on Developing Societies and Lokniti (India) and international and national democracy researchers from South Asia. IDEA’s State of Democracy assessment methodology is being adapted for the research, which will also seek to understand the culture of democracy in South Asia. More information about IDEA’s projects for Democracy Building and Conflict Management in the South Asia. In South Asia, IDEA continues to focus on Nepal. IDEA’s work in Nepal dates back to 2004, initially anchored in the field of citizen assessment of democracy. 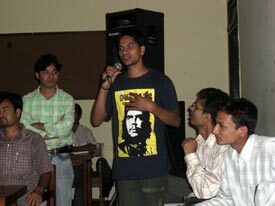 Following the 2006 democracy movement and the peace agreement, IDEA’s programme in Nepal supported local actors in the process of constitution building through the period of negotiation and preparation for elections to the Constituent Assembly (10 April 2008). IDEA is now supporting the CA members and committees through orientations and training, providing materials and background notes and supporting public participation to the constitution building process. IDEA is giving particular emphasis to the gender perspective of the constitution building process, facilitating platforms for women CA members and professional and civil society groups to address the constitutional issues. In the current context of fragile coalition government, challenges posed to implementation of the peace agreement and a worsening law and order situation in many parts of the country, IDEA believes that flexibility in responding to demands is important, and is facilitating dialogues on contentious constitutional issues such as the system of governance, affirmative action and the role and future of the security sector. The major challenges of the constitution building process in Nepal remain related to consensus building by stakeholders, assuring social inclusion in the constitution and other policies, managing the diversity of the country, and coming up with implementation mechanisms and independent monitoring institutions. While the constitution building process was scheduled to be completed in mid-2010, this deadline may not be met: and the adoption of the new constitution will not in itself be sufficient for the consolidation of democracy, as comparative experience elsewhere shows. Support to Nepalese stakeholders in addressing these challenges will continue to be relevant through the period of drafting and adopting implementing legislation and developing the practical working of the new agreements and institutions. IDEA’s current project, supported by Norway, runs until early 2010: it coordinates its work with UNDP and with other actors. The development of a continuation project has been welcomed by Nepalese stakeholders, to provide support throughout both the constitution building process itself and the subsequent period of drafting and adopting implementing legislation and developing the practical working of the new agreements and institutions. A three year project proposal is in the course of detailed design and will be submitted to Norway later in 2009. In addition, Finland is supporting a project to develop inclusion, supporting comparative knowledge resources and dialogues around an integrated approach to accountability that addresses constitutional rights, institutions of judicial review, and the political legitimacy of the institutional framework. The programme may in future consider addressing the development of political parties in Nepal. • To support participatory and inclusive constitution making processes. The project will reach out to marginalised groups by supporting initiatives to ensure a consultative constitution building process. • Increased professionalism by the electoral management body when carrying out future elections. • In the process of detailed definition based on discussions with local stakeholders and partners and flowing from the expected results above. • Improved understanding among the CA members (with a particular focus on the CA women’s caucus) and other stakeholders (including political party policy makers) on necessary conditions for effective implementation of women’s rights in terms of institutional arrangements. • Monitoring of potential electoral conflicts and violence using IDEA’s Electoral Violence Early Warning and Response Management Tool.